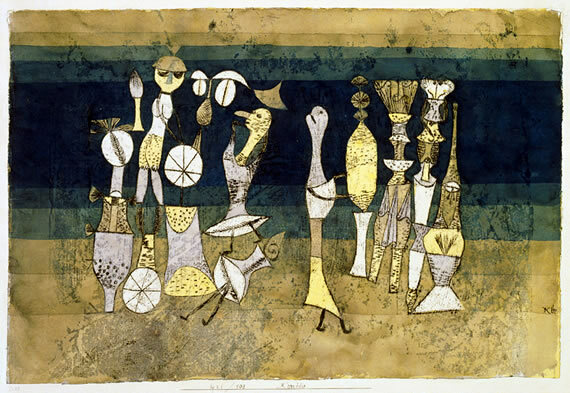 The Paul Klee we see in this exhibition is not one we have ever seen before. The experience is a deep shock to the system. Klee was never a painter of large formats and his work – an oeuvre of over 8,000 works from which Tate have collected 130 from private and public collections – is always intimate, detailed, scrupulous, intricate and usually very small in scale. It suits the cabinet spaces that are rare in public galleries, and requires the spectator to dance to the painter’s own elaborate musical score (Klee was a professional violinist married to a professional pianist) and he takes his famous lines for a walk and moves our eyes both close to and far away from his work for altering perceptions of the macro and the micro at the same time. We smile and we often laugh out loud looking at Klee. He likes to play. He liked to play with space and colour but he also likes to play with us. There is pictorial heft in great paintings like Fire In the Evening of 1929 where sombre and saturated blocks of patchwork colour accumulate and explode in the middle in a burning ember of a red square. (A heart? A hearth?) In the same year, 29 paintings later, we are Uncomposed in Space , where a sweet little stick man falls out of the deconstructed planes of paint that are like an exploded and deconstructed house. He can put together and he can take apart and his magic game of shifting scale is both his greatest and most impossibly indefinable secret as a painter. This great skill was evident in the last Klee survey – the excellent Hayward show of 2002, which still feels relatively recent. Walking into the first large gallery of the 17 huge rooms in this show at Tate Modern brings one up very short. It brings about an Alice moment. Not good at first. Disturbing. Alienating. The spatial shifts seem to be no longer inside the work but outside them, and the paintings seem to disappear down the rabbit hole, dwarfed by the huge brutalist walls designed for bravura; for large pictorial statements. The galleries make these paintings look somehow diminished by the idiosyncratic hang. They look crabby and scratchy and ... what is it? .... Yes, they look very small indeed. However this is a show where it definitely pays to read the text on the wall. Matthew Gale, the curator, and author of an excellent catalogue essay, explains something to the viewer that is very important. For a famously modest man, and also a very generous teacher, Klee was sure about his importance in the canon as an artist, a teacher at The Bauhaus, a writer of seminal texts, a thinker and a philosopher. Only self confidence would accompany such determined archivism and the fact that he catalogued everything meticulously allows Tate to take us into his mind and inside a body of work made with “intuition combined with exact research”. Every show we see has an embedded narrative. This is the tale told to us by the curator as he or she selects and hangs the work that is displayed in the public galleries and we (usually) absorb and endorse the story. So in using Klee’s own catalogue system here for the first time ever, with Klee’s own corroborating notebooks displayed, we may indeed be flummoxed by the lack of apparent intimacy in the display but we are privileged to attain huge insight into Klee’s working methods. We see abstract and figurative works together and it causes us to question why there should be an apartheid about these categories. We see work done in the same month or even week side by side. This most protean of artists works with child-like exuberance in 1920 on Episode at Kairouan or Comedy of 1921, noodling away in ink on a sort of zoomorphic cartoon, full of fun and skittish draughtmanship. In the same gallery space we see the more substantial and bold Red Green and Violet Rhythms of 1920. Once the eye and brain adjust to these juxtapositions, it is liberating. His friends and fellow artists Lyonel and Julia Feininger at the Bauhaus (the famous academy of craft, design and fine art that operated in Weimar, Dessau and Berlin from 1919 until 1933 where Klee taught, evidently very charismatically, in the 1920’s) called his studio at the school a ”carefully ordered confusion”. 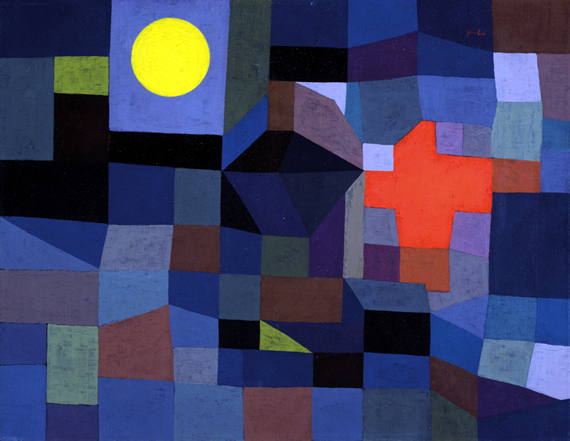 Klee worked on many paintings at the same time. We see this in documentary photographs, but here at Tate we can actually see the paintings together, made by Klee with “intuition combined with exact research”. The Tate have taken a leaf out of Klee’s Pedagogical Sketchbook and done the same with their exhibition. 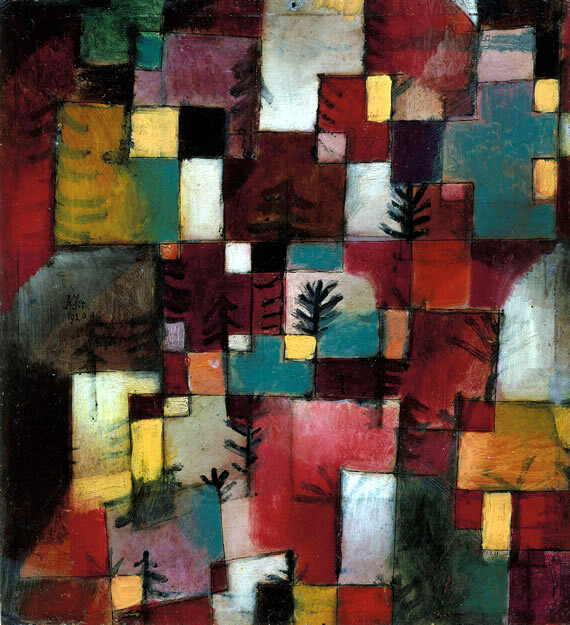 Klee would have taken his ever-present pipe out of his mouth and smiled with pleasure.